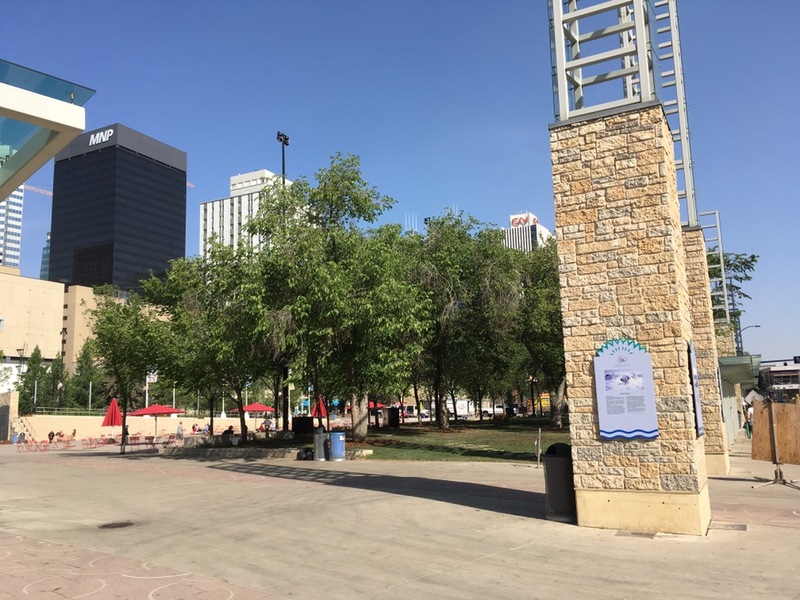 Time for the third part of the downtown Edmonton tour. This time, the Arts District. 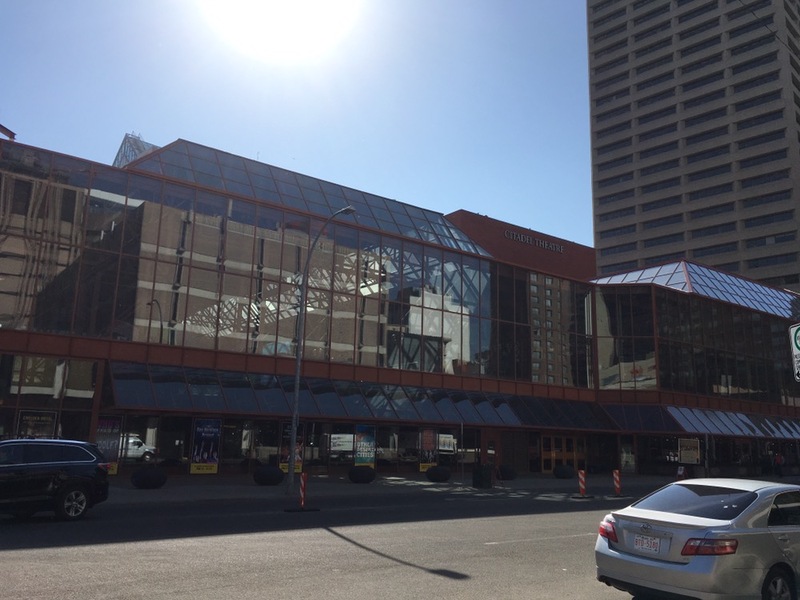 Edmonton is known as a cultural city with a lot of music, arts, and museums. We’ll take a look at some of the interesting architecture in this area. 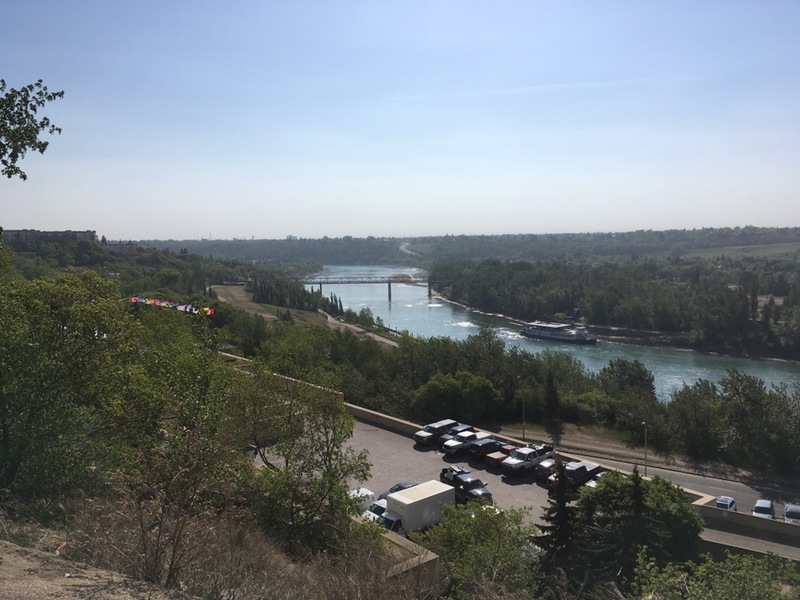 But first, the amazing river valley. 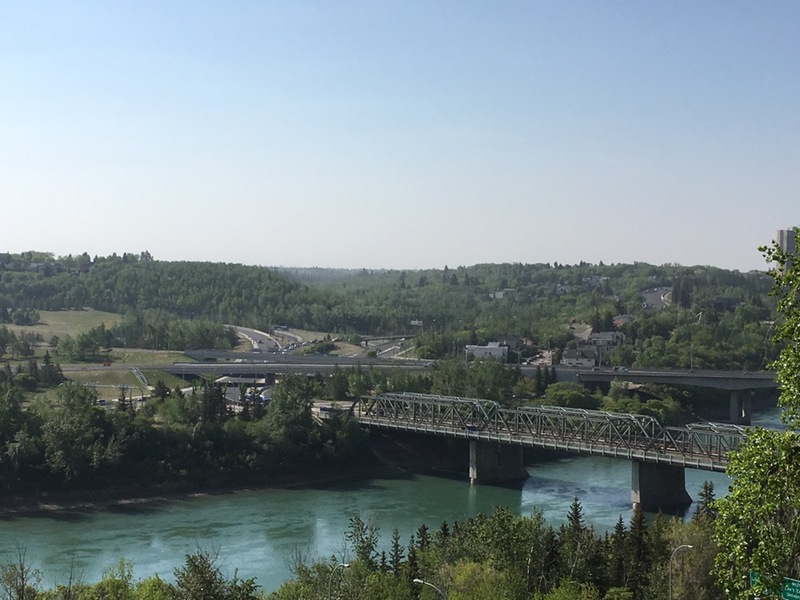 Downtown is situated at the top of the valley, commanding this great view down to the North Saskatchewan River. 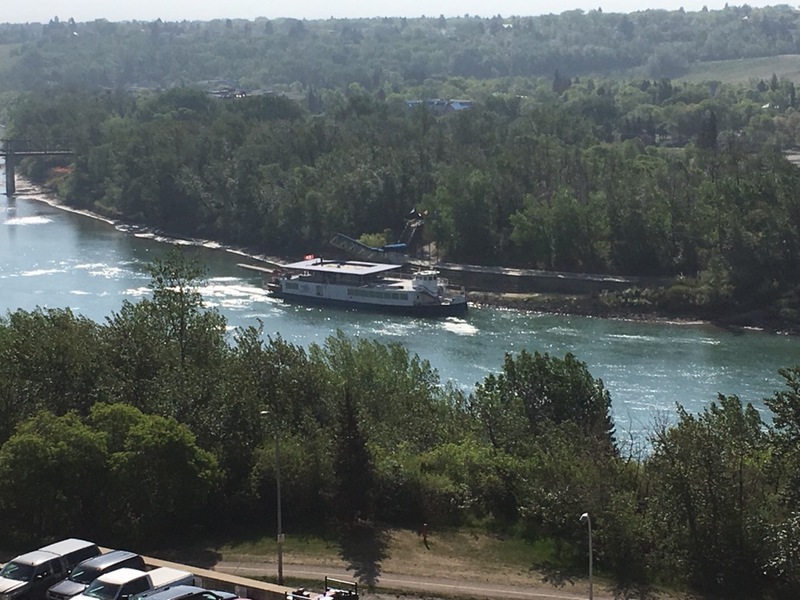 There’s a river boat called the Edmonton Queen. You can eat on it and go on a river cruise. It was recently sold in an auction. A look in another direction. The river is quite green. Now, on to the Arts District. One of the cultural buildings is the Citadel Theatre. There, you can watch plays and musicals. 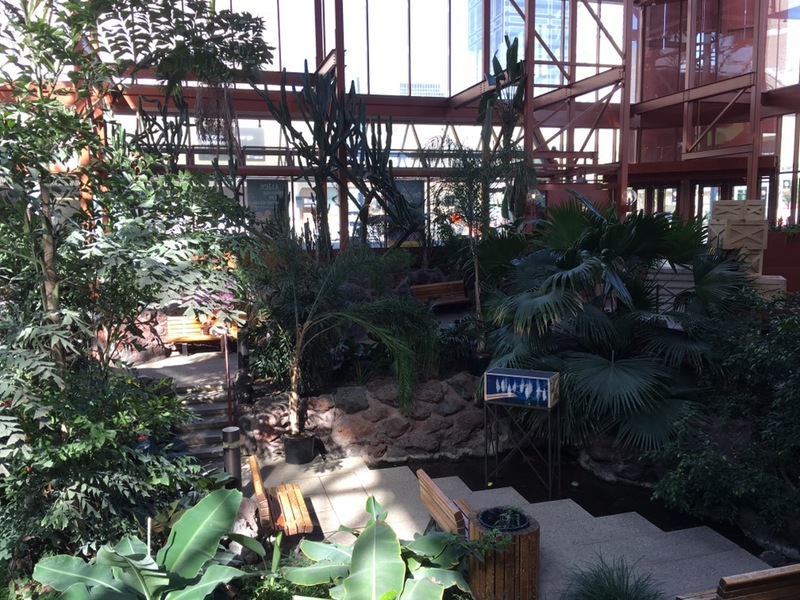 Not only that, there’s an indoor garden. It’s always warm in there. 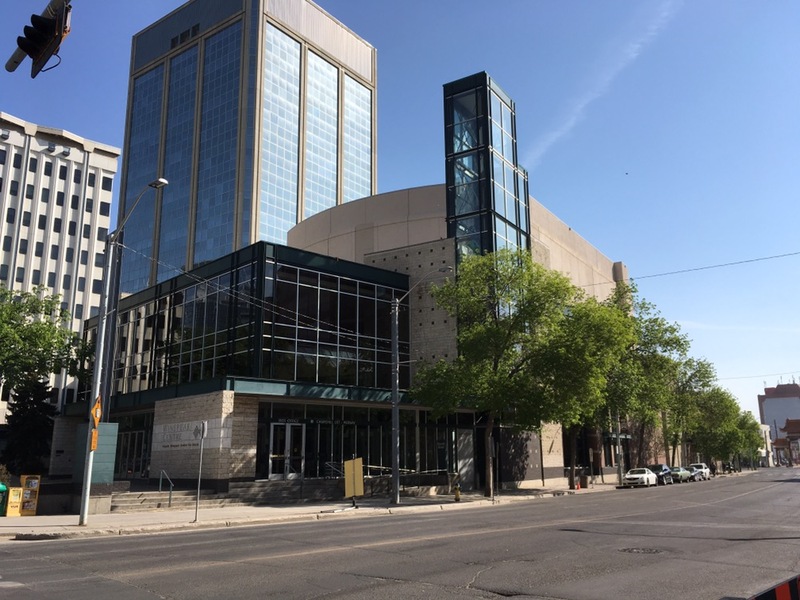 And here is the Francis Winspear Centre for Music, a concert hall that features the Edmonton Symphony Orchestra and other musical performances. A look back across the street, you can see the Citadel Theatre. 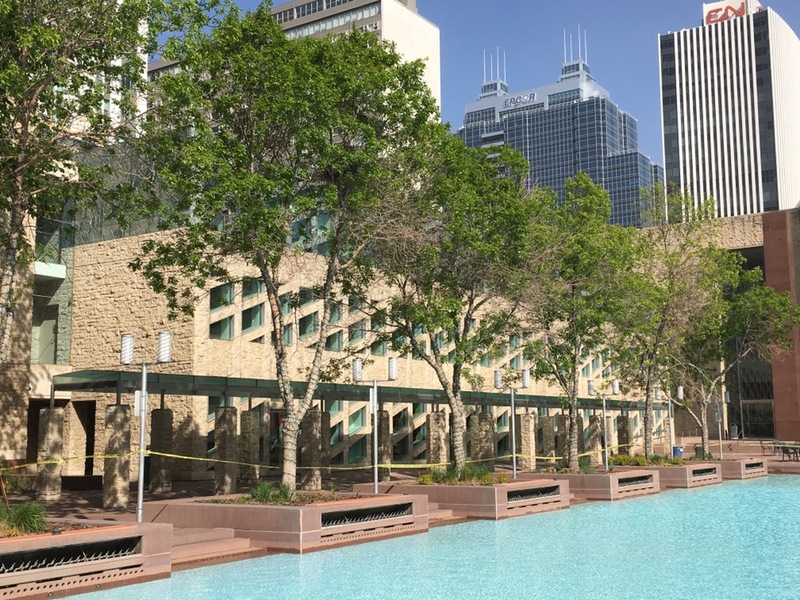 Here is the Stanley A. Milner Library, the main branch of the Edmonton Public Library. 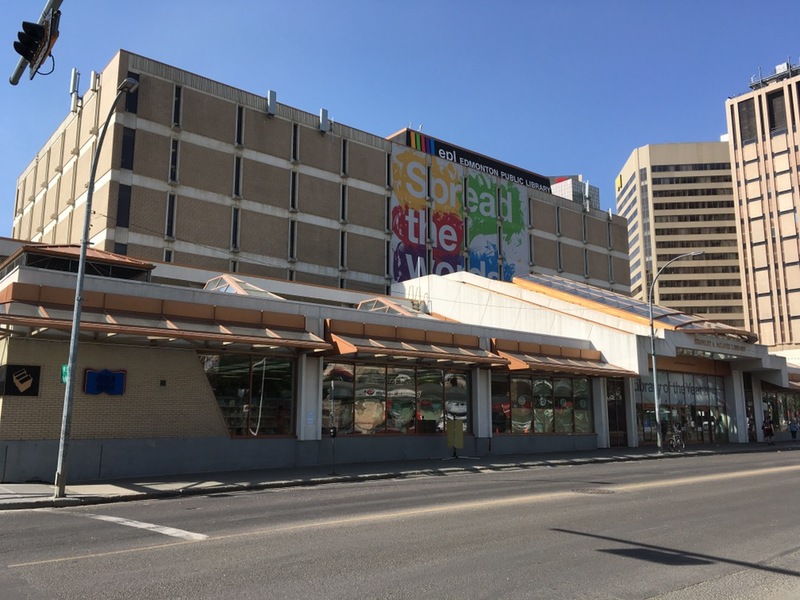 It’s not a very attractive building, but will soon be undergoing a major transformation. I can’t wait to see what it looks like. 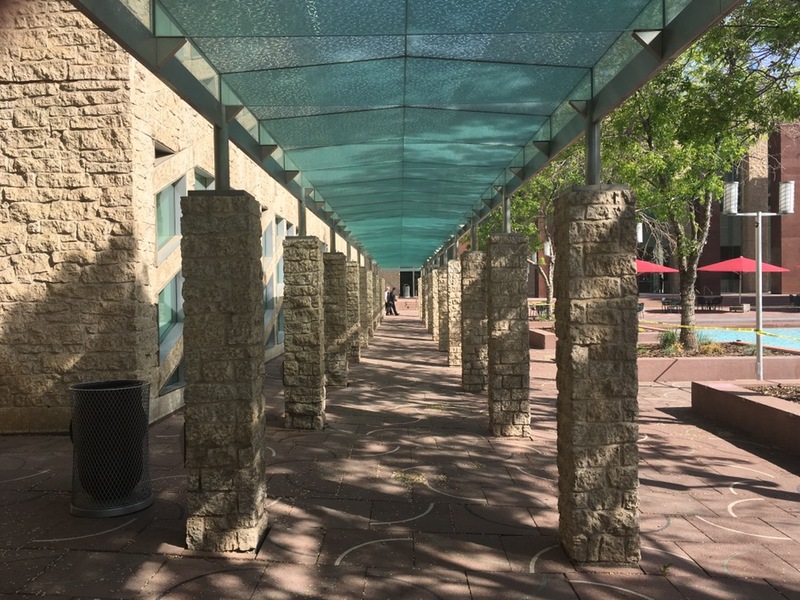 Right at the heart of the Arts District is the Sir Winston Churchill Square. It’s an open square with green space, cafes, and more. Several festivals occur here every year, as well as the occasional movie. The Square has a large open plaza for festivals. 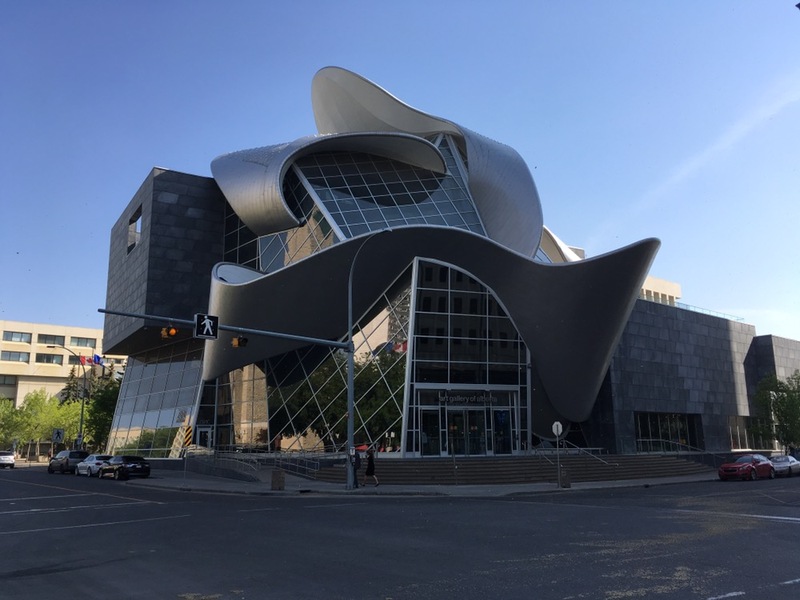 One of the newest buildings is the Art Gallery of Alberta. It’s a unique design, isn’t it? 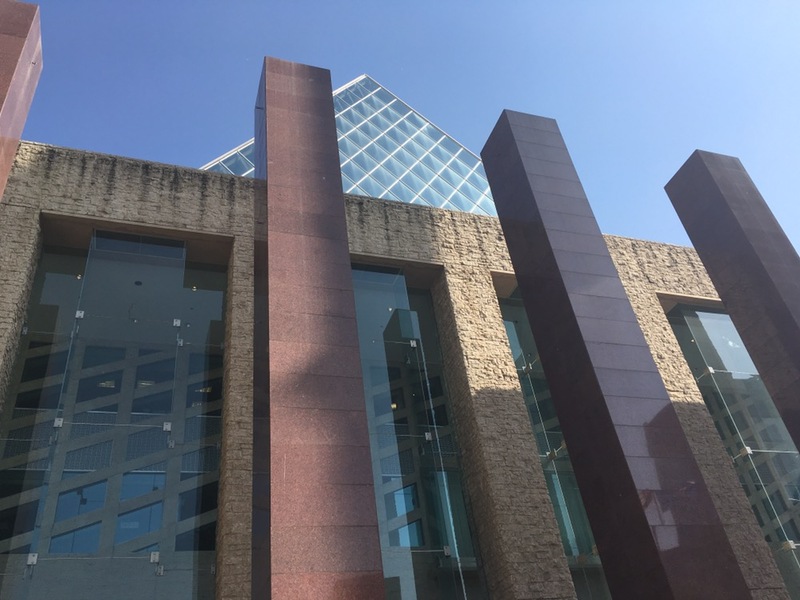 And then we have Edmonton City Hall. This is one of the more attractive city halls I’ve seen. 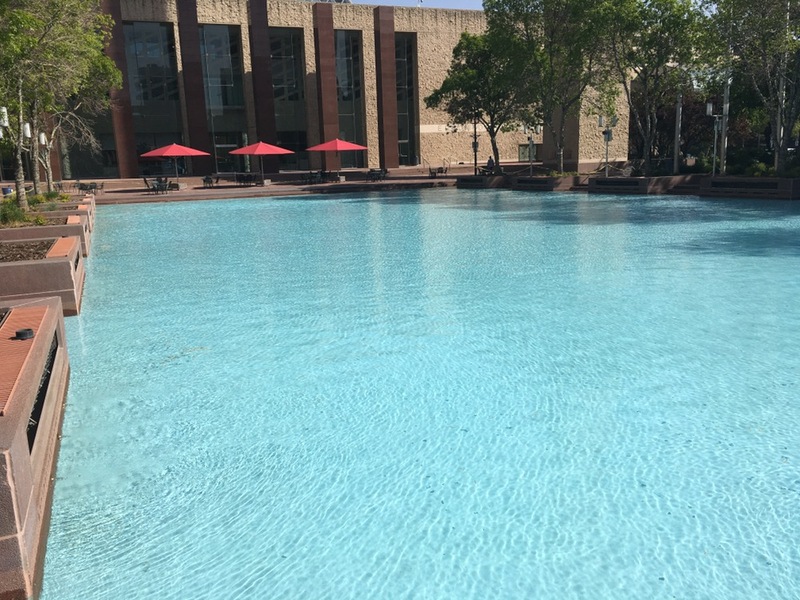 It has a large glass pyramid and a wading pool right in front. In winter, you can go skating on it. 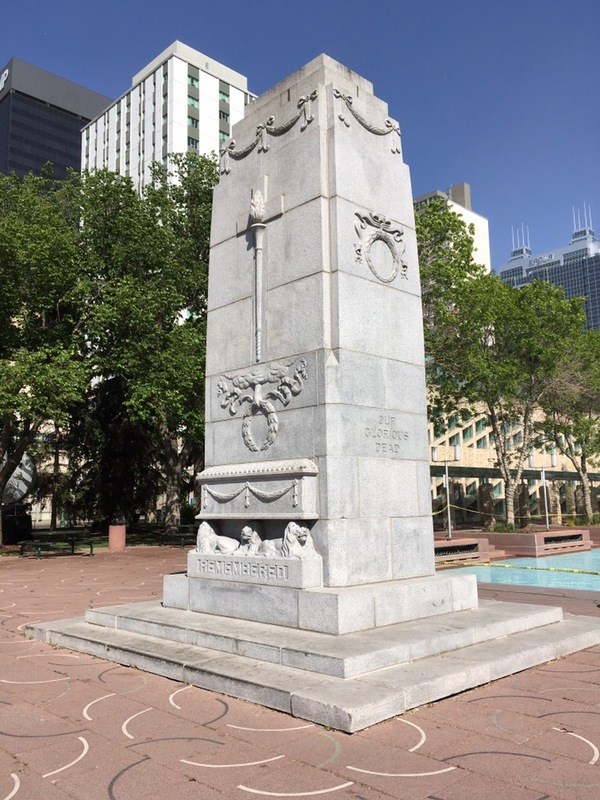 This is a war memorial in front of City Hall. 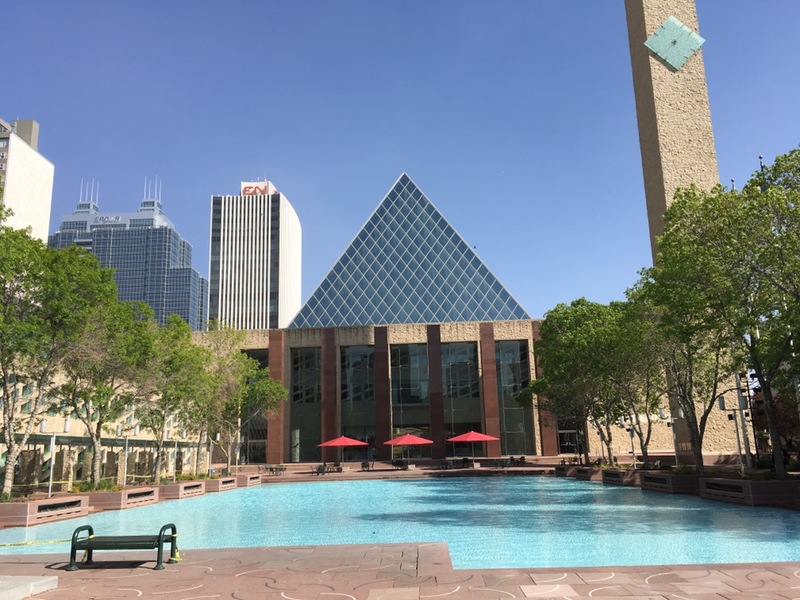 This part of City Hall contains a restaurant and changing area for the pool/skating rink. And here’s the pool. It was closed when I was there, even though it was a very warm day. Another feature at City Hall. Nice shady outdoor corridor. Looking up! Like the windows? 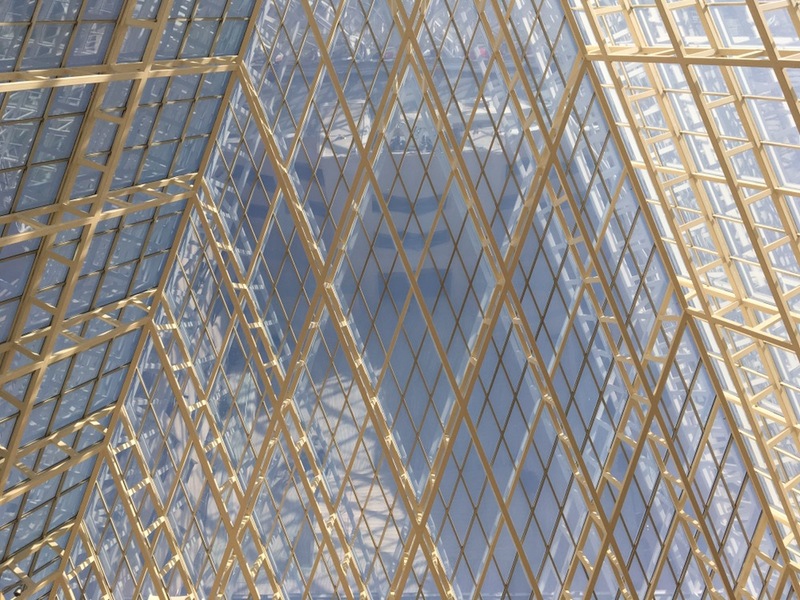 This is the pyramid from inside. Also under the pyramid, take a look at some of the architecture. 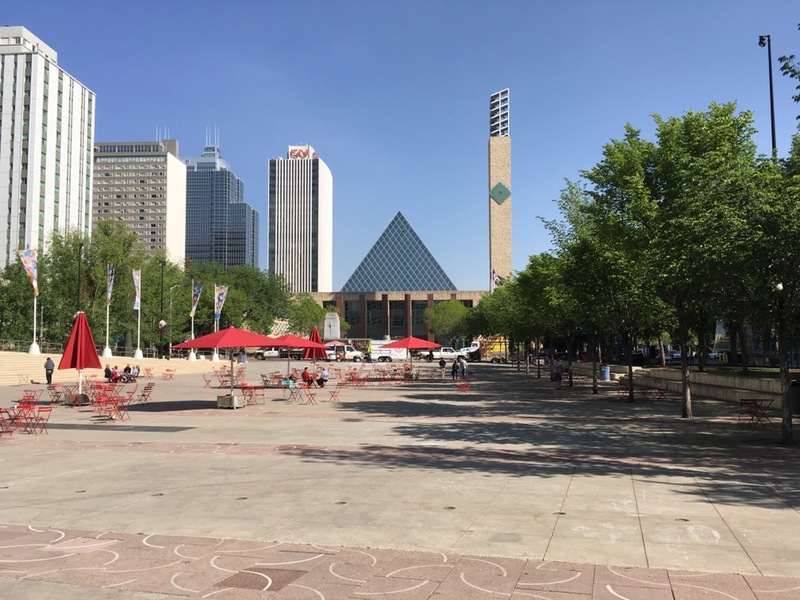 To finish it off, looking back at City Hall from Churchill Square, you can see some food trucks. 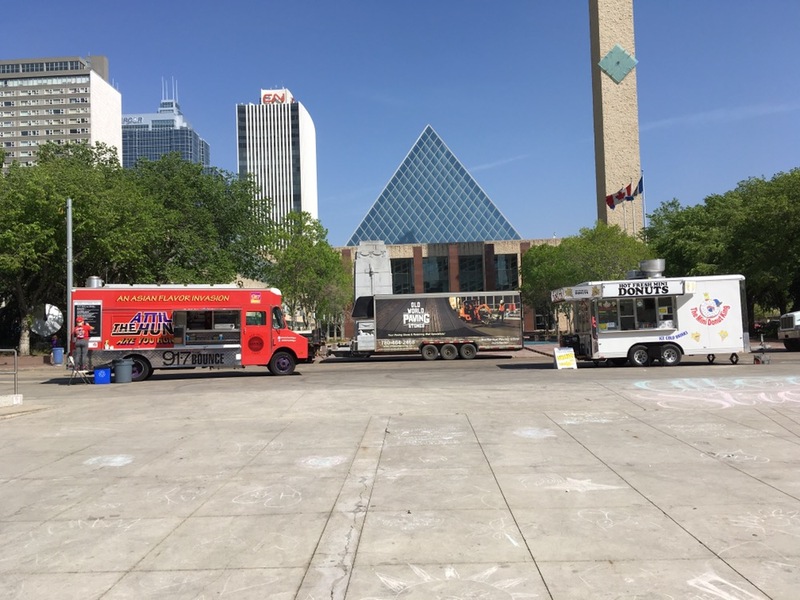 Edmonton has a fleet of these trucks offering many different kinds of food. They’re very popular. And that is the Arts District. I missed going to the Royal Alberta Museum, but it’s currently under construction. 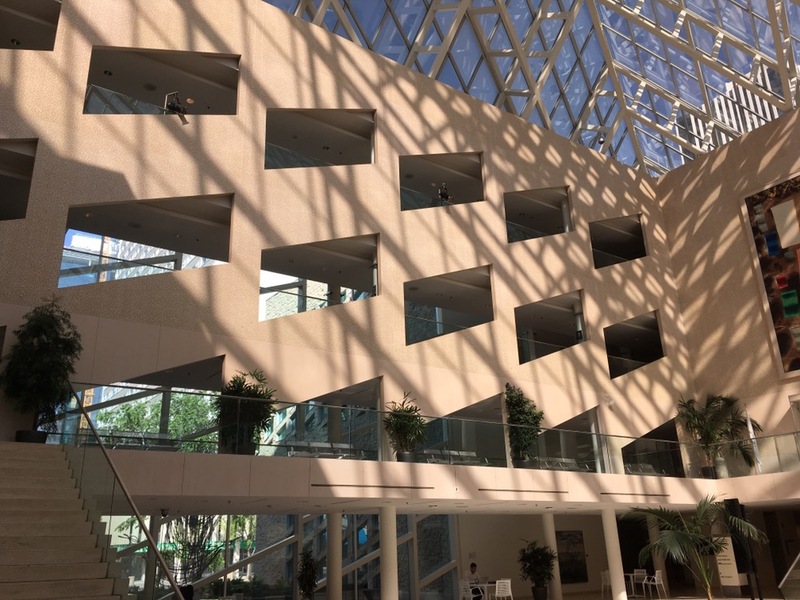 Next time, I’ll show you the government centre, including the Alberta Legislature. Looks amazing. Thanks for showing us around. No problem! One more set of photos to come.